The bodies of three women and 11 men were sent to the Government Rural Hospital in Mahad for identification and then handed over to relatives. A day after an unknown number of vehicles plunged into the Savitri river following a bridge collapse in Mahad, bodies of 14 passengers were recovered from the waters. Nineteen other passengers aboard two state transport buses headed towards Mumbai and a private car — the only three vehicles recorded as lost — remain missing. 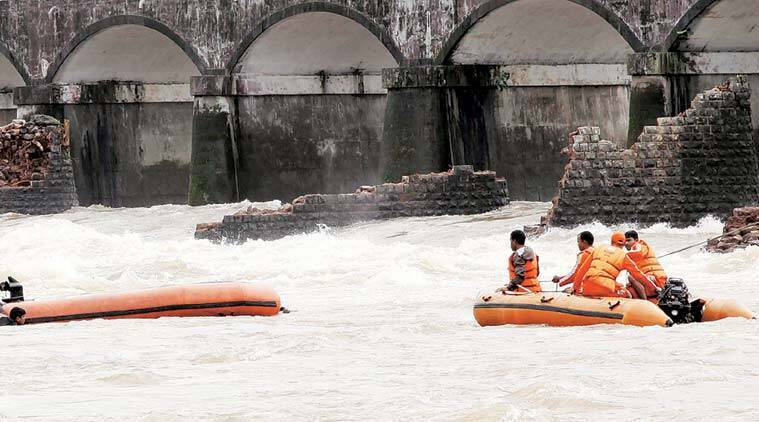 Search and rescue operations by the Indian Navy, the Coast Guard and the National Disaster Response Force (NDRF) were supplemented by locals using inflatable rubber boats. Rescue efforts suffered a blow early Thursday when a boat carrying NDRF divers toppled close to the bridge. “The current was very strong. One of our drivers sustained injuries to his hand and knee,” said Pandit Ithape, Assistant Commandant, 5th Battalion, NDRF. A large crane requisitioned from the National Highways Authority of India was pressed into service in the morning and held a 300 kg magnet in the river. “It has not been able to locate any vehicle but pulled out a pipe that was part of the collapsed bridge,” said Sanjay Patil, Additional Superintendent of Police, Raigad. After the magnet failed, the police sank three large hooks into the water a few feet away from the bridge, but was again unsuccessful in finding any sign of a vehicle. Authorities are only sure about two state transport buses with 22 people aboard and a Chevrolet Tavera car with nine passengers having washed away Tuesday night along with the bridge that was constructed during the British rule in 1928. The number of other vehicles that might have sunk are not yet clear, the police said. The nearest distance at which a body was found was 7 km away from the site and the furthest was some 60 km away, the NDRF said. “The passengers were swept away by the current and bodies have been found 15, 20, 40 km away,” said Anupam Shrivastav, Commandant, 5th Battalion, NDRF. He said the search, which had been restricted to 6 km Wednesday, was expanded on Thursday. While most of the bodies were found in towns in Mahad taluka, the NDRF said some washed away as far as Dapoli and Harihareshwar towns on the coast of the Arabian Sea.